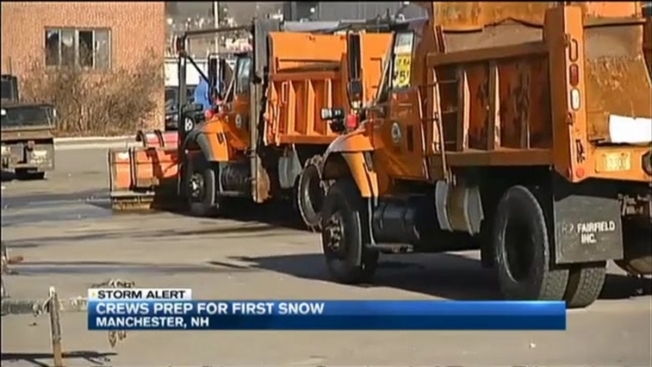 The winter weather is on its way, which means so too is the work for New Hampshire residents and officials. "The snow blowers are read, the snow tires are on, so we are good to go," said Weare resident Tracey Fitts. But when you live in New Hampshire, this is what you live for. "We'll go skiing and snowboarding, and I'll be happy," Fitts said. "You can cozy up in your house a bit," said Manchester resident Neil DuPaul. The snow will start flying after midnight Tuesday and Manchester could get up to a half a foot of snow. The Lakes Region could see more like 10 inches. On Monday, the public Works garage was buzzing as city employees prepped the plows and residents packed their trunks with buckets of sand. Meanwhile, we're told New Hampshire DOT has 700 plow trucks ready to go and has already treated some of the highways. DOT Spokesperson Willian Boynton says the state has used 1/10 the amount of salt it did by this time last year. State Police Captain Gary Wood says there is a concerning trend on the roads during every season's first snow storm. "We have a lot of cars off the roadway," Wood said Tuesday. So, He has a warning for drivers who may have been lulled into bad habits by this winter's mild start. "Please pay attention to your driving, reduce your speed, and allow enough time," he said. Granite Staters say they've got no other choice than to welcome Old Man Winter. "We're ready, it happens every year, this is nothing new," Fitts said. But they're asking Mother Nature for a break. "Last year was just too much," said Weare resident John Christie. "A really short winter, please, let it be a short winter," said Nashua resident Frank Alvarez. City schools are closed until next week, so DPW officials are asking families to stay home if its messy in the morning to allow plow drivers to do their jobs safely.